Today I decided to put the child gate in the hallway to keep Sean from going into the bedrooms and bathroom. I put the gate up at the time I thought that it would be high enough for the cats to go under only and not my son. Here is the proof that I was wrong. 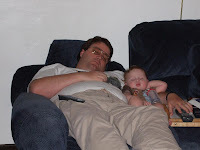 Here are some pictures of Robert, Jamie and Me taking a nap along with Sean. One night when we tried to lay Sean down for the night he crawled up to the wall and went to sleep. This picture was taken last night, Jamie tried to have him sleep in the bedroom while I was taking a nap in the living room, but he would have nothing to do with that. So Sean walked into the living room climbed on the couch next to me and went to sleep.